Greek: Γκαλάτσι (Galatsi); German: Galatz; Hungarian: Galac; Polish: Gałacz; Turkish: Kalas; Bulgarian: Галац (Galats); Ukrainian: Галац (Galats) and Russian: Галац (Galats). Archeological evidence points to occupation of the region in the neolithic period. For example, north west of the town of Galați, on the eastern shores of the Malina marshes, fragments of ceramic-type Stoicani Aldeni, stilex and tools made of bone have been found. A stone sceptre, from the late Bronze Age, belonging to the Coslogeni culture was found on the marshes’ southern bank. Galați town itself developed from an ancient Dacian settlement of the sixth and fifth centuries BCE where there was a ford across the Danube river. In 101 to 102 and 105 to 106, the Dacians fought wars against the Romans and the area became part of the Roman empire. From the 300s a Daco-Roman settlement developed at a ford south of the site of the Church of the Virgin. There is evidence of continuous inhabitation of Galați since the 600s. A treasure hoard consisting of 12 silver coins issued between 613 and 685 was found in a Byzantine tomb near the Church of the Virgin. Western and Byzantine coins from the time of Emperor Michael IV (1034–1041) were also found. At one time, the city became part of the Republic of Genoa Territories and was called “Caladda”. In 1445, a document signed by Stephen II of Moldavia mentions Galați. In 1484, Chilia was conquered by Ottomans. 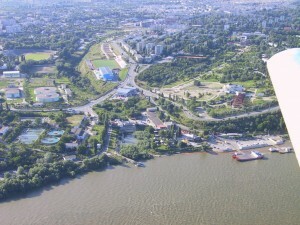 Galați township remained Moldova’s only port, not only for domestic trade but also for trade with Turkey and Poland. In 1590, the Galati Jewish cemetery was opened. dating it to 1 April 1664. Hetman Mazeppa was buried in a brick tomb. The traces of Its inscription containing an eagle with one head indicate Mazeppa and the Unkraine. The church was later plundered in Tartar raids but two Galați suburbs, “Mazeppa 1 and 2” are named for this man.